Feather Popular Twist to Open Safety Razor Review! In this review I will be talking about the extremely affordable feather popular twist to open safety razor. I mentioned this safety razor in my best safety razor article as one of the better inexpensive safety razors. If you are not quite sure if you want to get into wet shaving, this could be a great safety razor for you to find out without breaking your bank. On the other hand if you want the highest end safety razor I suggest you check out feathers other safety razor! Let’s jump right into the review so you could find out more about this plastic twist to open safety razor. The feather popular twist to open safety razor weighs in at 1.2 ounces. This is most likely the lightest safety razor that I have reviewed up to this point. If you have read any of my other safety razor reviews you should know that I’m not the biggest fan of light safety razors. This is due to the fact that you have to put much more work in to get a close shave as opposed to having the weight of the safety razor do the majority of the work for you. That being said, I feel like the balance of the safety razor is surprisingly decent. The aluminum knob at the top of the handle gives you a good idea of where you should be putting your fingers for the perfect balance point. The biggest problem is that is sometimes while your shaving your pointer finger can twist the knob and loosen the head while you are shaving. This is probably my biggest gripe with the safety razor. Overall the grip on the feather popular twist to open safety razor is good. It has black horizontal grooves on the majority of the black plastic handle. My favorite type of grip is a cross-sectional type of grip so that you have good grip going vertical as well as horizontal. But if I was only have either vertical or horizontal, I would rather have a horizontal grip like this safety razor has. This feather safety razor comes in at 4.5 inches long. 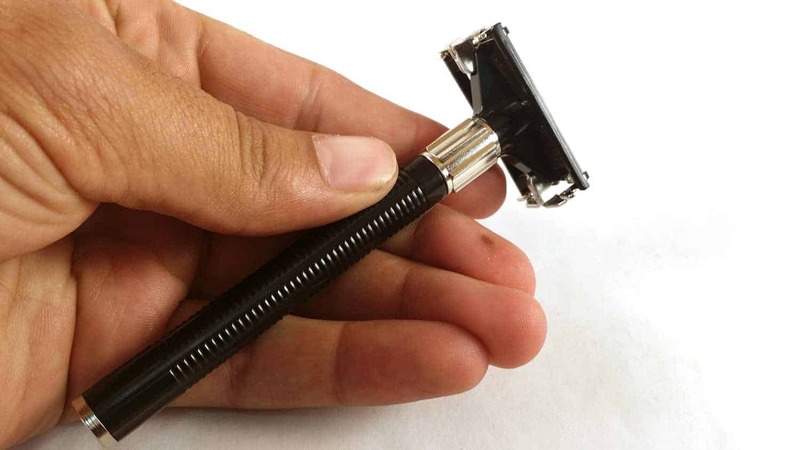 That is longer than the average safety razor and that can be a problem for people with small hands. Since I have relatively large hands, I enjoy the freedom of having a long handle. I feel like if the length was a little bit shorter the balance point towards the top of the handle would not be as good as it is. In my experience, twist to open safety razors tend to be more aggressive than three-piece or two-piece safety razors. I would rate this feather safety razor approximately a 5 on my aggressiveness scale. The biggest problem with this is that it should be meant for a beginner due to the price point, but it is slightly more aggressive than what I would recommend a beginner using. If you are a beginner and also have a relatively thick stubble to cut through, this might be a perfect safety razor for you to start out on. 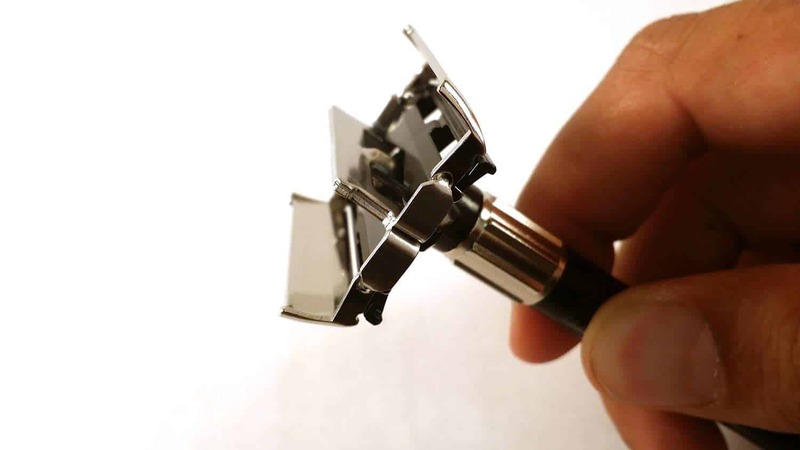 Just like any other twist to open or butterfly open safety razor, the blade replacement is extremely easy on this safety razor. Just twist the aluminum knob towards the top of the handle to open up the plastic hinges in the head. The biggest problem with twist to open safety razors is that they do not hold the blade as secure as a three-piece safety razor typically does. I noticed a little bit of movement of the blade while fully tightened. In addition to this I noticed that I accidentally loosened the mechanical head while holding the safety razor due to the fact that the balance point is right at the point where the handle meets the knob. Be sure to check out our article on the best safety razor blades. Don’t just take our word for it, check out the consensus of almost a thousand other user reviews here. Overall this is a decent safety razor for the price point. It has a decent grip as well as provides a decent shave for what you’re paying for. The biggest downfalls are the overall weight in the fact that the blade does not fit perfectly in the head and can get loose during your shave. I would recommend the safety razor for somebody that needs something mildly aggressive for their stubble, and does not want to pay too much money to get started in wet shaving. Let me know what you guys thought of my feather popular twist to open safety razor review. Also be sure to check out our definitive lists of quality shaving soaps, best shaving cream for men, shaving brushes, and even shaving bowls so you can have the ultimate kit. Have a shavetastic day!